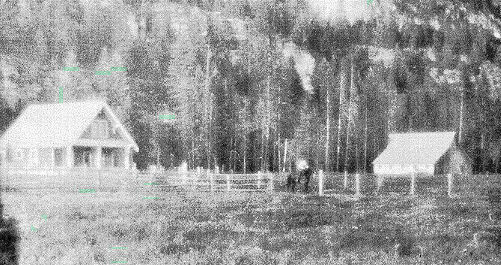 ﻿ William Ellis became a forest Ranger at Trout Creek in 1908. After a year William quit the Forest Service and he and his wife, Nettie, took up a homestead at the mouth of Copper Creek on Bull River. While details are lost to history, the Ellis' home was most likely a log building. When they left it, William moved his family to Rock Creek to take out timber. To drum up business, especially from those who took the train to the county seat on business, Herriot's Store in Thompson Falls was, for a short time, giving a free package of Star Naptha washing powder to ladies who visited their establishment. Surely it was an alluring temptation to fashion conscious women. Fashions had changed from bustles and voluminous skirts to slim and sleek gowns whose hemlines dropped to feet clad in high-topped button shoes. When they went to the dances and community gatherings, women might be gowned in current fashions or wear styles popular years earlier; femininity and cleanliness held more importance. Starched white blouses, and floor-length skirts that might be plain and fitted or embellished with ruffles, depended on current fashion and the financial circumstances of the wearer. When hardships mounted and babies were born, everyday wear mellowed to somber colors with less ornamentation. Yet, those who conformed to custom donned hats and gloves when they ventured from home on Sunday, or at any time. However, the women who had spent months or years traveling by wagon train courageously transformed custom and let wisdom dictate how they dressed. Grandma Gordon was one exception. Following her husband's death (when women weren't allowed to own property) the male members of the Gordon family sold her land. Circumstances expelled her from the southern plantation life she'd always known and into the wagon-train migration that ended with their arrival at Noxon. One wonders whether it was custom or rebellion that made Grandma Gordon steadfastly cling to her sunbonnets. Men continued to wear suits and white shirts, and they polished their shoes because a man's image counted mightily. Conduct was strictly censured by those of Victorian-minded parentage and an upbringing dictated by religious codes. Urie Ellis homestead situated at the base of Government Mountain on the northside of the Clark's Fork River, downstream about three miles from Noxon. It later became the Otto Rettig home. Courtesy William Ellis collection. ﻿﻿Like the men who settled in this rugged land, the women faced momentous tasks demanding courage, strength and a certain individuality of character. Necessity forced them to do men's work; to cut hay, wood and ice; to till the soil, plant, tend and preserve large gardens. Helping her mate in all sorts of adversity eroded many prudish and Puritan beliefs of what women's place and women's correct conduct were. Many a dainty ankle was clad in trousers; many a 'lady' rode horseback astride as easily as sidesaddle. 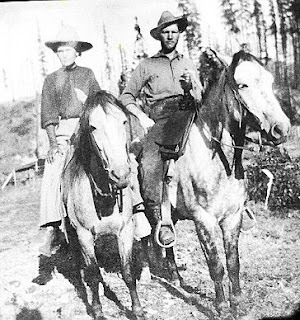 William Ellis, Forest Ranger, and his wife, Netti, out for a ride. Circa 1909. Courtesy William Ellis collection. While some of the women could set an elegant table and exhibit all the current social graces, many did not have the means, the training, or the inclination. 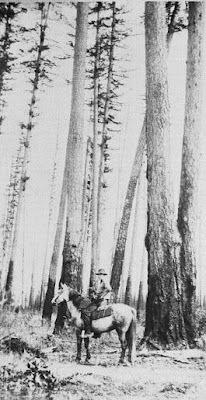 They were more at ease out of doors, cussing as they skidded logs, slopped the hogs, butchered the chickens, pitch forked hay to the cow and then milked her, shot the venison or killed the marauding bear, cougar or coyote. They were tough, resilient and resourceful women who lived gustily and without pretenses. 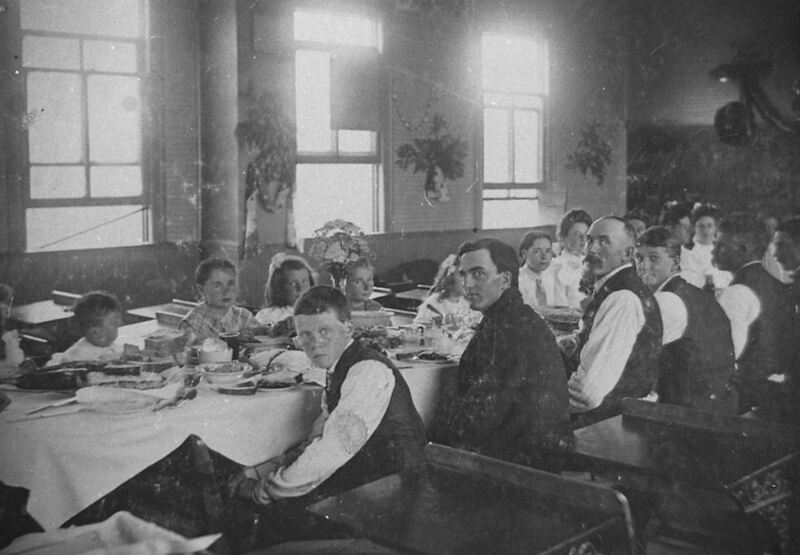 Box socials, the events to which females brought baskets filled with favorite delectable dishes for which they hoped their favorite beau would give the winning bid, and thus eat with them were popular entertainment fund-raisers. Soon the box socials began costing the fellows anywhere between $2.50 to $10.00 for the privilege of lunching with a favorite girl. Competition was keen to have the basket most desired, whether it was for creative flair, popularity, or scrumptious cooking. The girl with a beau determined to eat with his love was at a distinct advantage and he was soon put to a severe test. As soon as the 'sports' in the crowd detected (usually by means of beforehand duplicity) any male vulnerability to a particular basket they began actively conspiring to thwart him. The 'sports' would take up collections and ply the most obnoxious, old, preferably disreputable, man at the affair with coin to purchase the lady's basket, gleefully enjoying all that ensued. No 'upright' young man could let his sweetheart be forced to thus share her basket with the offensive man. More than one swain 'supported' a good charitable cause by bankrupting himself and all his friends to meet the challenge presented by a 'good' basket social. Bill and Marie Boomer, their children, Jim and Neva, and friends. Courtesy Clayton Bauer collection. Happy occasions such as box socials, dances and baseball games that year helped allay the uneasiness voiced by some participants. Normal summer rains were noticeably absent in 1910. On the fourth of July Noxon hosted a baseball game. It was a festive affair, drawing people from all the neighboring communities. Ice cream was the greatest delight for the children, but no one suspected it could be the last memorable festive community celebration day in a summer that was becoming hot, dry, and fire plagued. Don Maynard, another small, tough, handsome young man came to Noxon to play in the games, from working on the fire-line back of Heron. He had been camped out fifty-three days fighting forest fires and was nearly as black as his coal-black hair. His dad was owner of Maynard's saloon. 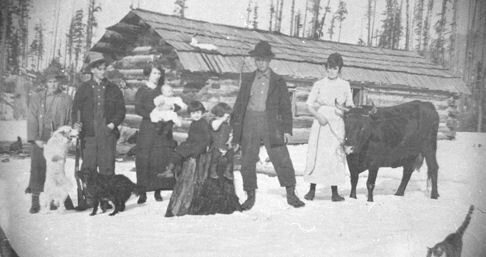 Pauline Gordon at the Noxon Ranger Station with her daughters, Stella, Grace and baby Blanche. Circa early1900s. Courtesy Blanche Gordon Claxton collection. 1. Sanders County Commissioners Journal.